If you’ve read the article here with Shinya Suzuki about Bay Brewing Yokohama then you’re one step ahead of those who haven’t. I’ll wait for you to go read it. Ok, now that you have read it, we can dispense with the back story and history of Bay Brewing Yokohama and move swiftly on. Opened in 2011, Bay Brewing Yokohama was one of the first brewpubs on the scene in Kannai, and Suzuki-san’s reputation has enabled him to have a decent variety of Japanese craft beers on tap all year round. A little quiet when we arrived, but busy soon after. Bay Brewing Yokohama is located about five minutes from JR Kannai station’s north exit, and is based on the ground floor in a semi-residential area. The bar is quite small, with seating for around twenty people but expect to be standing at the weekend and on Friday nights too. Suzuki-san has a penchant for wrestling, or puro-resu (プロレス) in Japanese, and posters adorn the bar and the toilet too. When BeerTengoku paid a visit, the bar was half-filled up at about 3pm on a Saturday afternoon, but within thirty minutes it was packed and people were standing outside drinking. We were quickly seated though and managed to strike up some conversation with Ando-san and Suzuki-san within a couple of minutes of being in the bar. What did we want to drink? Were we hungry? What did we want to eat? The next thing we know, the people next to us were telling us about how good the wheat beer was and how much they came to the bar. Talk about friendly. Which beer to drink is always a difficult, but good, problem to have. Another example of too much head. A nice, well balanced weiss beer. The beer list varies from week to week. On our visit, there were three Bay Brewing Yokohama beers on tap, along with some from Aqula Beer from Akita. Yonekyu Mori Beer was also on the list, a new one for us and perhaps got the name wrong, with the final tap being taken up by Shiga Kogen. 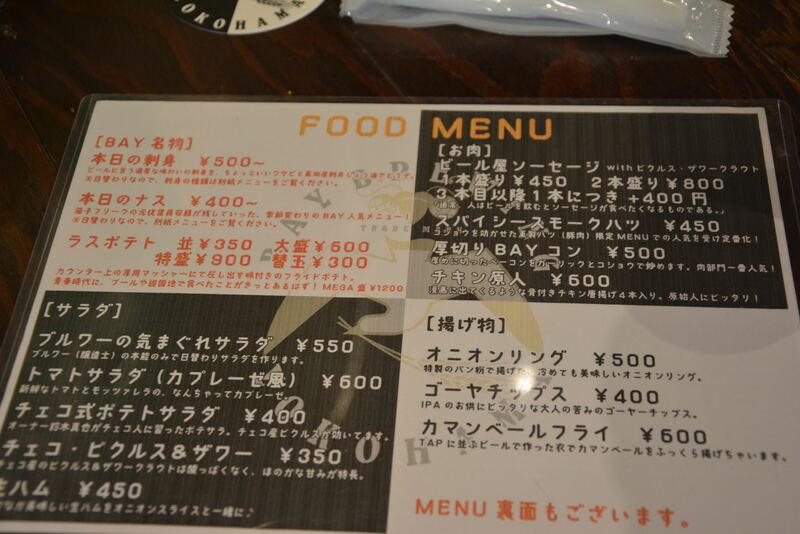 Prices are reasonably at 600yen for a UK half pint size (284ml) and 900yen for a US pint size (473ml). We opted for the UK half pints sizes to get as many different beers in; however, the Imperial Bay Pilsner was more than enough for us, but the Bay Brewing Weizen comes heavily recommended. In a market with so many weizens, it’s good to finally taste one that quenches the first but retains the qualities of a weizen. Just go for the chips. Seriously. Extra large portion too. We’ve also heard a lot about the food at Bay Brewing Yokohama but all we wanted to try were the goya chips and the fries. The goya chips were simply goya, or bitter gourd, sliced up thinly and fried but retaining the bitter quality of goya. If you like goya, you’ll like those. But the fries. The fries are worth coming here alone let alone for the beer. On top of the bar is a metal cylinder that you’ll hear clunking away during your visit to Bay Brewing Yokohama, and not doubt it will be making some for you. The machine squeezes out freshly made fries from mash potato…let that sink in for a bit…..OK. These fries are then fried to produce something verging on perfection and pair well with all that is on offer. 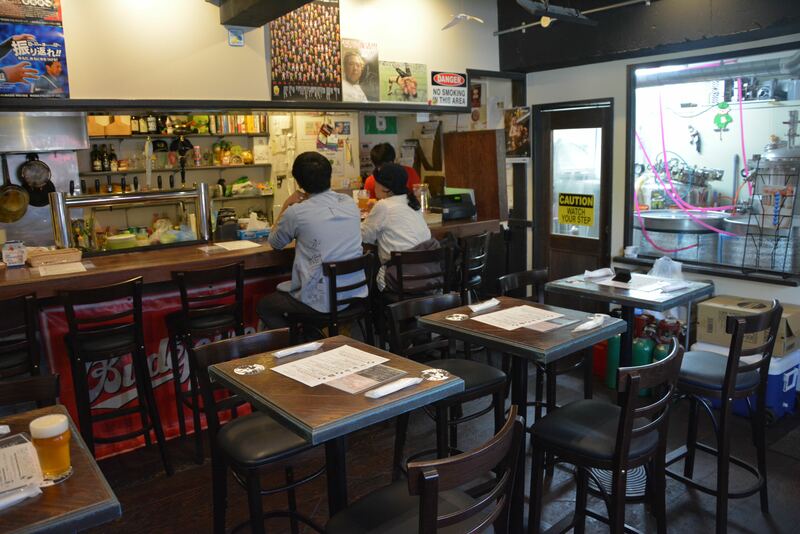 If you’re in the vicinity of Yokohama, let alone Kannai, it’s well worth going to Bay Brewing Yokohama for a couple of beers and enjoying the atmosphere. With seven taps on the go, it is more a case of quality over quantity and you’ll definitely find a beer that you suits you. Directions are from Kannai station on the JR Keihin-Tohoku line.